MFA Photography 2010 Alumni Madiha Aijaz has been selected as one of the 40 participating artists at the 2018 Liverpool Biennial. The exhibition is up at the Open Eye Gallery in Liverpool UK is on view until October 7th, 2018. At Open Eye Gallery, Madiha Aijaz presents a new film installation. These Silences Are All the Words explores the public libraries of Karachi, Pakistan, against the backdrop of the city’s changing landscape. Focusing on librarians who have been working for years in traditional institutions such as Bedil Library, Aijaz tells the stories of an aging intelligentsia. 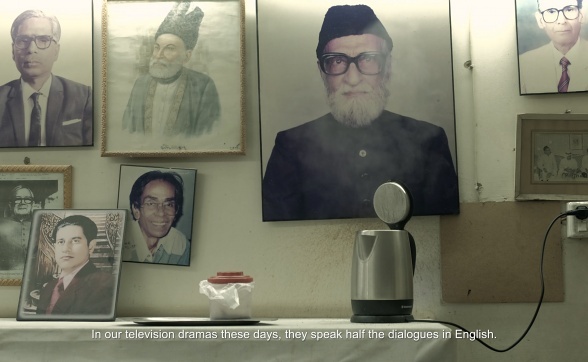 The conversations with both librarians and the library’s users reflect on the shift of language from Urdu and its poetic and literary history to the ambition and individualism associated with English. Many of Aijaz’s works similarly offer a perspective on a country sharply divided along linguistic lines. Her work contextualises the complexity of the postcolonial state and its ambitions surrounding the English language, not only as the legacy of the Raj, but also as a tool for authority and social mobility. Using photography, film and text, Aijaz combines different media to present a city’s history from a literary point of view.